To celebrate my little man’s 100 days on earth, I prepared a feast for his “first eating” or okuizome as per the traditions of my ancestors. The okuizome is a Japanese weaning ceremony held 100 days after birth to celebrate the tiny person and wish him an abundance of good food throughout his life. Since eating is one of life’s greatest pleasures, I wanted to make sure my little man would have an abundance of deliciousness throughout his life. Of course, little man does not have any teeth yet, nor is he eating a dungeness crab, so we just pretended to feed him. Yes, I pretend fed a toothless baby a celebratory crab carcass. Then I took photos as per another proud Japanese tradition of enthusiastic photo-documentation. Though traditions vary with region, according to my mom and the interwebs, a typical okuizome meal includes red bean rice (osekihan), a whole red snapper with head and tail intact (tai) to symbolize a strong neck, other auspicious foodstuffs such as octopus, lotus root, beans, or pickled plum (umeboshi), and a smooth round pebble to symbolize strong teeth. In Japan, babies are dressed in fancy kimonos and have okuizome dining sets with tiny dishes for the occasion. For example, check out my cousin Anna’s little man’s okuizome portrait with his whole fish! Here in Davis, I had to improvise a bit. My local supermarket did not sell a red snapper or any whole fish with the head and tail intact except for a limp looking rainbow trout. Clearly, you cannot have a proper celebration without a proper carcass. So I went with a dungeness crab instead. I figured it’s reddish in color, a proud celebratory carcass, a nice nod to the region and season, and I got to eat it afterwards. I asked the guy at the fish counter for one baby octopus which I boiled. I included a slice of melon on the tray because Japanese people love melon (don’t really know why) and placed a smooth rock that I found on a beach in Hawaii in the dish. Oh and I actually made osekihan from scratch! Osekihan is eaten during special occasions in Japan and made with mochi rice and azuki beans which give the rice a pinkish color. It is the Japanese version of beans and rice. In general, I am not a big bean fan and I had never made beans and rice in my life. I also always thought osekihan was made by pouring some prepackaged “osekihan” powder into cooked rice which turned it pink. But for my little man, I actually soaked the azuki beans overnight and prepared osekihan for him. Here it is sprinkled with black sesame seeds and salt (gomashio) and served in little man’s special rabbit bowl. Little man’s okuizome may have been a wee unconventional, but it had some California flair and it’s really the effort and spirit that counts. And even though I know this is a food blog, I had to include one picture of my little man. When the three squabbling asians need quick and delicious fortification, we inevitably turn to NOODLES! In the three squabbling asians kitchen, two of us get very cranky when we are not fed. You can guess as to which two. We all love noodles and it’s ready in less than 20 min. Yuan and I grew up in households where noodles were the go-to meal and keep noodles in our pantries at all times. As Yuan says, “Having no noodles is like having no rice.” The horror. Last weekend we all got together in Davis and had a full day of activity and cooking. Sunday morning, I found duck broth, fresh spinach, roasted pork belly, and Bernie’s backyard Banty eggs in my fridge. The duck broth was made from the carcass of the roast duck we bought to make duck dumplings. No part of duck was wasted in our operation. The spinach was picked fresh from a friend’s garden. The roasted pork belly was leftover from a self-indulgent pork bun operation the day before. I reheated the pork belly, sautéed spinach with ginger and boiled some noodles. I made the broth by putting one small dallop of duck fat, a swirl of soy sauce and ground black pepper in the bottom of each bowl. Then, right before the noodles were done, I filled the bowls halfway with a mixture of duck broth and boiling water to taste. I rinsed the noodles and placed a portion in each bowl, then added the spinach, pork belly and fried banty egg on top. Dericious! In addition to our cooking projects, we enjoyed the beautiful spring weather by visiting the Davis farmer’s market where we picked up some yummy vegetables and a hunk of jowl bacon. We also checked out Picnic Day at UC Davis where we watched dogs herd real sheep and wiener dogs run races. No, really, there were wiener dogs racing and/or wandering around in the “Doxie Derby” complete with an announcer, instant replays and custom graphics. Little Miss suffered a giggling fit watching the little dogs running around with their floppy ears and one wiener’s fight with his mortal enemy – orange traffic cone. We spent an enjoyable and productive weekend in the “country” and kept the squabbling to a minimum. I hounded the mushroom vendor at the farmer’s market for almost two months in search of the cherished mushroom and finally purchased 4 small mushrooms for $30/lb. I excitedly told a friend about my great triumph in obtaining my precious matsutake to which he replied, “oh, I just went hiking on the coast and they were growing all over the place. I’ll take you if you want to go tomorrow morning.” I immediately forgot that I’ve been told my entire life never to pick your own mushrooms for fear of death, and got up at 7 a.m. (believe me, this is EARLY for me for a Saturday) to drive to go mushroom picking. We went down a trail, then bushwacked into the woods a bit, and lo and behold! A MATSUTAKE! I couldn’t believe it! It smelled like the real thing, looked like the real thing, and was growing out of the ground! I squealed like a teenager at a Jonas Brothers concert and did a little happy jig. 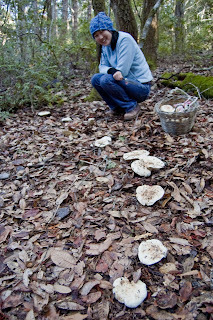 Jake taught me to look in the leaf litter for slight mounds near tan oak and huckleberry bushes, and the distinctive characteristics of the matsutake, like the shreddable stem, white color (some with brownish discoloration), and gills attached to the stem, which is covered by a partial veil. Then he showed me how to pry them from their leafy beds. 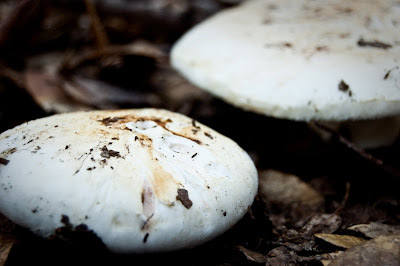 When I started the day, I made a personal goal to find at least one matsutake during the trip but once I started to recognize what to look for, they were everywhere!! Then I really hit the motherlode. I saw a small white button peeking out from beneath the fallen leaves and as I was uncovering it, I noticed that there was an half arc of them. By the time we stopped for lunch in this awesome field, we had collected almost three bucketfuls of matsutake. On the way back to the trail, we stumbled upon a patch of chanterelles, including the prettiest chanterelle I have ever seen! 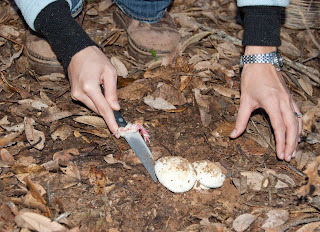 I ate an all mushroom diet the next day, then spent about 24 hours worried about dying of renal failure due to some deadly mushroom I had just consumed, but remembered that I definitely know what matsutakes smelled like and really, nothing else smells like it. I’m also still alive. Over the course of the last month, I have been experimenting with various mushroom recipes. Usually, you try to find ways to economically stretch out the precious fungus that you paid an arm and a leg for and you barely have enough to make the two matsutake classics, matsutake soup “dobinmushi” and matsutake rice. 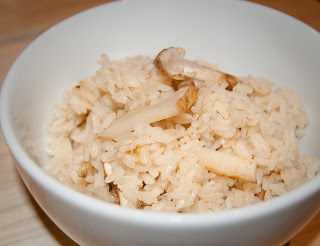 I made a matsutake dashi and steamed some rice with the broth, a splash of sake and soy sauce, and sliced matsutakes. The steam from the rice cooker filled my house with that wonderous pungent piney aroma. I gave some to the local Japanese restaurant owner (who then gave us some complimentary treats! ), I froze some for later, and made mushroom dashi which I keep in the freezer. I also made matsutake noodle soup, matsutake dumplings, matsutake egg custard (chawanmushi), and various chanterelle and matsutake omelettes, pastas, and sautees. The chanterelles were meaty with the most amazing buttery texture and the matsutakes infused everything with their wonderful matsutake fragrance. 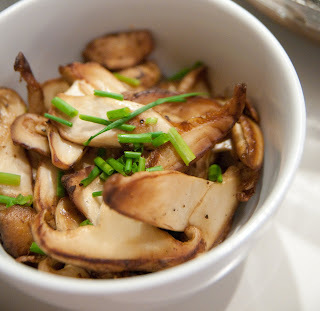 Highlights were a shellfish pasta with chanterelles and matsutakes, and this simple but savory matsutake butter saute with ginger and homegrown chives. 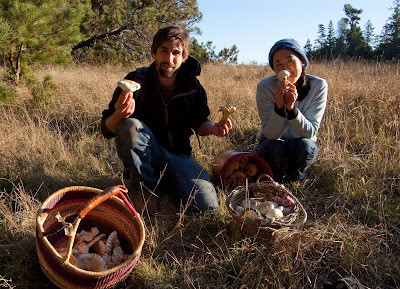 Thanks to Jake and mother nature for a matsutake adventure in deliciousness. This afternoon, I fried some pork cutlets Japanese style. I used some pork tenderloin I had in the freezer which I pounded into cutlets. Not having a fryer has never stopped me from deep frying in my own kitchen. You can fry anything Japanese-style by liberally salt & peppering, dredging in flour, egg wash, and panko. 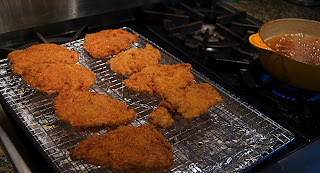 Allowing the breaded item to sit for a bit in the fridge helps the frying process. Make sure there is enough oil and that it is hot. I test by dropping a bit of panko into the oil to make sure that it bubbles on the surface instead of floating down into the oil. Don’t use utensils to put items into hot oil because accidentally dropping your breaded morsel can result in oil splashage, burning and fire. I find that using my hands to gently slip the items into the oil works the best. Be careful not to fry the tips of your fingers!